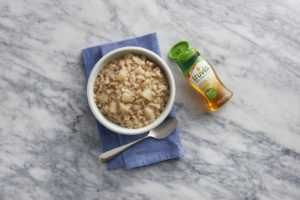 Win Truvia® Nectar, The Reduced-Calorie Way to Love Honey! The new year is here…and you just might be looking for ways to cut calories. If so, we’ve got your solution! Truvia® Nectar is a blend of honey and stevia leaf extract that’s twice as sweet as honey and sugar so you only need to use half as much to get the same level of sweetness. Use it in place of honey or sugar in any application–from beverages to baked goods. For a perfect way to start your day, try this Vanilla Pear Oatmeal. Use 1/2 teaspoon of Truvía® Nectar (1 serving) in place of one teaspoon of sugar, honey or agave. To start the new year right, we’re giving away Truvia® Nectar samples to 10 lucky AppforHealth.com fans. All AFH terms and conditions apply. Entries will be accepted until February 1, 2017. It looks so good and healthy. Would love to try. Thanks for the chance and Happy New Year! This would be delicious in my hot tea in the winter afternoons. Also am a Facebook fan and subscriber. I love honey but I usually have to use more than a tbsp to get the sweetness I want, I’d love to try this Truvia Nectar to help reduce the amount of honey I use. This would be ideal for my soothing tea drink which I would enjoy daily. What a great product. This sounds delicious to add to both coffee and tea! Thank you and I’m a Facebook fan and subscriber. I love Truvia! It’s so versatile. As a type 2 diabetic I am always eager to try to come up with ways to enjoy the sweeter things in life while managing my blog sugar and weight! This is why I am so excited for truvia nectar!!! I am already a fan of AFH, signed up for the eclub, and this is my comment! Thanks!! I’m cutting down on my sugar consumption in the new year and I’ve enjoyed the sample packets of powdered Truvia I’ve been lucky enough to try. A honey blend would work great in my hot beverages and cereals. I have Liked Truvia on Faebook. I signed up for the e-club newsletter. I am excited to try it because it has a blend of honey in it and I am a fan of honey. I would like to try it because we like honey and use it in our coffee and tea. I would like to use this in cooking. I am always looking for healthier alternatives. I am trying to use healthier sweeteners, so this would be great to win, so I can try it. I liked Truvia® on Facebook and signed up for the Truvia e-club. I’m excited to try brand new Truvia® Nectar because I’m always looking for new, delicious, healthier sweetener alternatives. I’m excited to try this because i like the sweetness of sugar but don’t want all of the calories.